Doubly good in triple digits, our unique summer seasonal is made with the fruit of the prickly pear, a cactus native to Shiner, Texas. With a tart, citrusy flavor and a crisp finish, it’s the best use of cactus yet. 12 oz bottle pours a crystal clear copper color with a modest cap of off-white head. Fair retention and lace is excellent, sheeting even. Nose is sweet and fruity, almost like red Kool-Aid. Not unpleasant, but not very beer-esque. Taste shows more beer character with a nice grainy malt complimented by a berry fruitiness, maybe a little floral. Im assuming this uses the prickly pear fruit as opposed to the leaves given the flavors here. Its pretty good, I am a sucker for a good fruit beer and this one delivers a tasty treat that is not too sweet. A wonderful Summer brew that has a slight sweet after taste. Crisp and refreshing. Any time a brewery tries something new, they get points for trying (in my opinion). This is a unique, easy drinking beer. Personally I like the sweet flavor. Pours a clear light golden color with white head. Pear, light fruit on the nose; follows onto the palate. Light bodied. Finishes with light fruit flavors. Sweet. Pours a clear deep amber producing 1.5 fingers of frothy, beige, shortlived head that leaves no lacing. Aroma is crisp but perfumey prickly pear & stone fruit, floral & lemon with a mineral hint. Taste is tangy, prickly pear, citrus, vegetal & medicinal with a slight toasted malt hint, it has a cloying perfumey sweetness up front with a tart but mild drying finish. Aftertaste is fruity, mineral & lightly bitter. Mouthfeel is medium bodied with moderate carbonation, thin with a light prickle, drying in the finish & aftertaste. 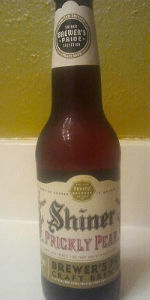 For those who have never tasted raw prickly pear flesh this brew is pretty true to the aroma & flavor as I remember it. Sampled this evening on 4/2/15. Bottle chilled down to 36 degrees F in my beer cooler and poured in to a "CHEERS-BOSTON" handled-glass stein. This 'Summer Seasonal' brew pours a pretty copper in color with a thin off-white head. A good amount of lacing was seen when sipped which was really surprising. The aroma is of some sweet fruits for the most part. More going on with the taste as the 'pear' flavor is up front but isn't over sweet with some grains. Slightly dry finish. Overall it was good but different. Lighter to medium-bodied with good carbonation as seen with all the small streaming bubbles rising from the sides and the bottom of the glass after the pour.